Nadine Smith has been writing since 2010. She teaches college writing and ESL courses and has several years experience tutoring all ages in English, ESL and literature. Nadine holds a Master of Arts in English language and literature from McMaster University in Ontario, Canada, where she led seminars as a teaching assistant. All great soccer players spent much of their lives training alone, in addition to practicing with a team, even before they ever joined one. To improve at the game of soccer, not only do you need to practice with a team, you also need to focus on developing skills on your own in your backyard or on an empty pitch. A few inexpensive items, a patch of grass and a little discipline will help you get the most out of solo soccer training. A few soccer balls, a dozen pylons and some kind of real or makeshift goal with a net is all you need to practice foot skills when training by yourself. Because you have no one to retrieve balls for you, having a few balls with you will allow you to take several shots on net without too much disruption to your training. Set up your pylons in a row first and dribble around them and then increase the difficulty of the exercise by arranging them erratically or diagonally. Replace a passing partner with a brick wall. Kicking a soccer ball against a wall is the only way to practice receiving and trapping passes when training alone. You can also practice one-timing, volleying, heading and saving the ball with a wall. Aim the ball at various spots on the wall with varying control and power to give yourself ricocheting passes and shots at different angles and speeds. 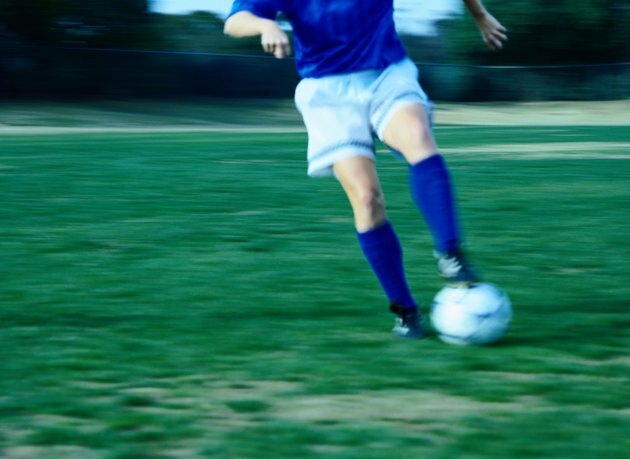 Jogging around the block does not simulate the physical demands of a soccer game. Soccer involves sprinting various lengths, stopping and starting quickly, turning and jumping. To practice all these movements and maneuvers, build a fitness routine for yourself that encompasses everything from long distance running to sprinting to jumping squats. Try completing the regimen before working on your foot skills to accustom your feet and legs to controlling the ball while exhausted, which is how you would likely feel during an actual 90-minute game. Take advantage of not having to follow the scheduled drills and exercises of a formal practice and focus on the areas where your skills and fitness need improvement. Practice shooting and trapping the ball with your weaker foot. Perform skills you do poorly over and over again until you start to see progress. For example, shoot at corners of the net where you have difficulty scoring on or practice heading the ball. Also, build up your leg strength if you need to or spend more time on wind sprints if you find yourself feeling winded in games. What Basketball Workout Should You Do if You Are Practicing Alone? What Is the Perfect Workout Routine for a Tennis Player?